Black-headed dwarf chameleon, Durban dwarf chameleon (Eng. ); KwaZulu-dwergverkleurmannetjie (Afr. ); iLovane (isiXhosa); unwabu (isiZulu). Chameleons are found throughout most of Africa. Dwarf chameleons are unique (endemic) to South Africa. The KwaZulu dwarf chameleon is a lizard that is endemic to KwaZulu-Natal. Its original common name ‘black-headed dwarf chameleon’ is unsuitable; the reason being that this species does not have a black head. This misnomer (and also the specific epithet melanocephalum) originated from a museum specimen whose head had turned black as a result of preservation. The KwaZulu dwarf chameleon belongs to the genus Bradypodion, which has 15 currently described species; however, this number may change because of ongoing research being done on the genus. The KwaZulu dwarf chameleon is a small, brownish chameleon, but like other chameleons it can change colour and pattern for camouflage. It is not more than 11 cm long. The tail is as long as the body or marginally shorter in females and the casque (helmet-like outgrowth on the head of chameleons) is low and weakly formed. The lobes of the gular crest are small and triangular, and the shallow gular grooves are pale or white. The dorsal spines are reduced, unevenly spaced out, and weakly developed on the tail. The body is covered with equally sized granules and there are a few scattered, flat tubercles on the flanks which may form one or two rows. The KwaZulu dwarf chameleon has many features that are suited for a tree-living existence. Their feet are unique, the fingers and toes of each limb are webbed and arranged in opposing groups with three toes on the outside and two inside enabling the chameleon to firmly clasp twigs and branches. This enables the chameleon to maintain a firm grip particularly on very windy days and during the night when it is sleeping. In addition they also have a prehensile tail that assist the animal when walking along thin branches; it is used as a balancing organ and helps to anchor the animal during windy conditions. When foraging, the KwaZulu dwarf chameleon moves slowly, and the conical protruding eyes are rotated about independently in any direction for maximum field vision. Most dwarf chameleon species are solitary; although they may occur in local concentrations, they tend to avoid each other. In cases where two individuals meet they avoid head to head confrontations, rather they turn their broadsides to each other and inflate their bodies and throat for maximum effect. When this happens they tend to adopt bright colours, particularly in males, who open their mouths to display the inside in a show of disobedience. Chameleons are well known for changing colours and they may do so to suit the conditions in which they find themselves. The distribution of many dwarf chameleon species can be divided into two groups. There is a coastal group whose distribution is limited to along the coastal areas, and the inland group, whose distribution is mainly along the eastern escarpment. The species is found along the coast to the north of Durban, and extending south to Umtumvana and Mkambati. Furthermore, it also occurs inland to Pietermaritzburg, Boston and north to Greytown. The KwaZulu dwarf chameleon typically occurs in isolated populations that are limited to very small patches of suitable habitat. 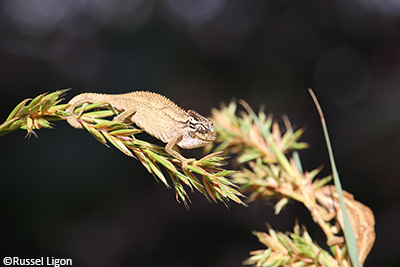 The KwaZulu dwarf chameleon is known to inhabit a variety of vegetation types, including reedbeds, high grasses, bushes, riparian thickets, trees and urban gardens. KwaZulu dwarf chameleons are primarily insectivorous; they prey upon flies, grasshoppers, crickets, insect larvae and other small invertebrates. They catch their food by waiting in ambush for passing insects or by patrolling through vegetation searching for prey. Once an eye has located the potential prey, the head is turned to face the object and the other eye is brought into focus on the prey. In this way binocular vision and depth of field is achieved. The animal approaches the prey slowly until the prey is within reach of the long distensible tongue. The tongue in some species may be as long as the body and tail. The tongue is brought forward to the front of the mouth and controlled there for a moment before being shot out to catch the prey on its sticky, expanded tip. They don’t have molars, canines and incisors, but very small, rounded teeth or ‘acrodont dentation’. These teeth are not good for chewing and biting; instead they crush prey using their jaws and swallow it whole. Mating occurs in spring and the females are viviparous, giving birth to 5–20 live young. In most Bradypodion species during the breeding season, adult males become brightly coloured, however, in the KwaZulu dwarf chameleon, male colouration does not differ greatly from the female’s mottled brown colour. Furthermore, they engage in ritualised displays that include, amongst others, head bobbing, expansion of the gular region to display the colours of the gular folds and posturing with one of the forelimbs extended. These displays frequently escalate into vicious fights that result in one of the contestants being bitten or dislodged from the branch. The fertilised egg develops over several months, each inside a separate sac inside the female. The female will then deposit the sacs on the surrounding vegetation and the young will break through by moving and stretching. Most species are said to be very productive and the females may produce 2–3 litters per season. The babies are fully developed when born and fully equipped for survival. The KwaZulu dwarf chameleon lives for about 3–5 years. It takes about nine months for the KwaZulu dwarf chameleon babies to reach maturity. KwaZulu dwarf chameleons do not live in families; they are normally solitary, but may occur in local concentrations. KwaZulu dwarf chameleons are completely harmless, however they do bite freely and when bitten a painful nip can be experienced. In natural conditions the boomslang or tree snake is an important predator, and amongst birds, both shrikes and starlings feed on chameleons. Spiders feed on the babies and small chameleons. Sometimes other chameleons also feed on the KwaZulu dwarf chameleon. In gardens KwaZulu dwarf chameleons are normally killed by domestic pets such as cats and dogs, and they are also killed accidentally by pesticides that are used to control garden pests. Furthermore, they are often killed when crossing the road. Anthropogenic activities are a threat to these chameleons, such as habitat loss due to developments and illegal collection for the international pet trade. The KwaZulu dwarf chameleon has the ability to change colour and camouflage just like all the other chameleons. The colour changes originate from special cells under the scales called chromatophores (pigment-containing and light-reflecting cells) and melanophores (cells that contain black or brown colour cells); this helps the animal to get away from predators. Just like all chameleons the KwaZulu dwarf chameleon also has a projectile tongue that they use to catch prey. Furthermore, they have a well-developed sense off sight. The KwaZulu dwarf chameleon can see in almost all directions without turning their heads and body except behind their heads, their eye sockets are designed to allow eyes to move independently, which gives them a 360° view of their surroundings. KwaZulu dwarf chameleons provide ecological services by eating insects and other invertebrates, thus controlling their numbers. They are also a food source for snakes, birds, mammals and other chameleons. They can be used as an indicator of changes in geological processes and climate change. In some African cultures chameleons are believed to evoke mystery and fear. They are largely traded in the international pet trade where they are highly priced, which fuels the demand. The KwaZulu dwarf chameleon is vulnerable according to the reptile atlas and it is listed in the vulnerable category in the national Threatened or Protected Species list for reptiles. The future does not look good if there is continued habitat destruction and illegal collection for the international pet trade. In addition, the use of pesticides in gardens also threatens the species, which is highly localised. Alexander, G. & Marais, J. 2007. A guide to the reptiles of southern Africa. Struik Nature, Cape Town. Tolley, K & Burger, M. 2007. Chameleons of southern Africa. Struik Nature, Cape Town. Jacobsen, N. 2005. Remarkable reptiles of southern Africa. 1st ed. Briza Publications, Pretoria.